If you’re looking for white sands, a hip restaurant scene, ancient ruins and intimate hotels, choose Tulum for your honeymoon. Whilst most of the Mayan Riviera is home to large all-inclusive hotels, Tulum favours small, chic, boutique properties with excellent gourmet cuisine. Foodies will love the chance to dine out at rustic tables or on the beach along with the fashionable set that flock to Tulum. Candles, thatched roofs and string lights will all make dining in Tulum a highlight of your honeymoon. 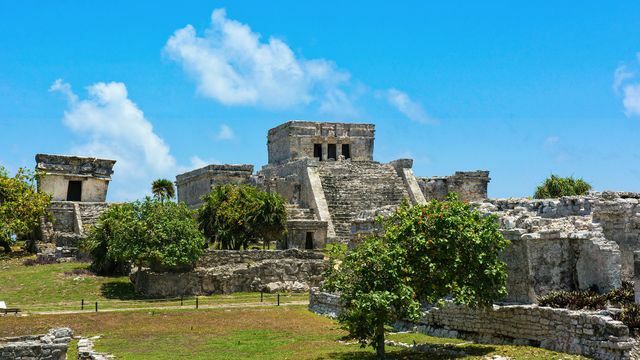 Shoppers can take advantage of excellent deals on trinkets at either stores in the town or along the beachfront whilst culture buffs will love the chance to explore truly ancient Mayan ruins either at Tulum or Coba. Adventure seekers will be in paradise with zip-lining, kayaking and floating down underground rivers. But make sure to make time for plenty of doing nothing! Sipping cocktails in the pool, lazing on the white sands and unwinding with your new spouse is Tulum’s expertise! If a Tulum honeymoon sounds like your idea of paradise, read on to learn more! January to March is the peak season with increased prices, crowds and temperatures. Savings can be had if you travel in November and December when the sea breezes keep the humidity lower. July to October is the hurricane season. If you can tolerate the risk of storms, heavy downpours and high humidity, there are excellent deals to be had at the hotels. April to June is springtime in Tulum with pleasant weather but hotel prices can fluctuate a lot so keep an eye out for a good deal.